I refer to the Mind, Body and Spirit exhibition that goes ahead twice a year in Cork City Hall. Based on our visit to the show last March, a number of people purporting to be psychics and fortune tellers had stalls at the exhibition. The costs on display were significant, on the order of 40 to 50 euro a session. As you are opening Cork City Hall to psychics on a regular basis, it is only fair to point out that many of these people may not be providing the services they purport to offer. Many psychics use a practice known as “cold reading”: a psychological technique where information is gleaned from the customer, and replayed back in a way that seems to indicate that the psychic has special powers. This technique simply exploits our normal human inability to absorb and recognise disconfirming information. Many magicians and mentalists use the same techniques, but they never claim psychic abilities. Not one psychic has ever been able to demonstrate their powers in a properly controlled trial, strongly indicating that these claimed abilities do not exist. By opening the City Hall to psychics, please remember that you are exposing people, sometimes at a difficult time in their lives, to individuals who claim access to special wisdom. It is extremely unlikely that this special wisdom actually exists. In any case, the benefits are doubtful and the disadvantages may, in some cases, be serious. There are instances of customers listening to the advice of psychics instead of seeking proper medical or psychological treatment. Even looked at benignly, it may be an unwanted interference in the grieving process, offering people false hope when they are trying to come to terms with a loss. If even one “psychic” at the show is knowingly using trickery to exploit their customers, surely this is an issue of concern? 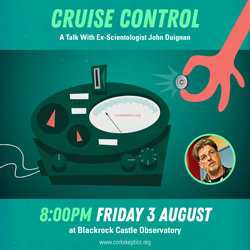 Other displays of highly dubious benefit were represented in the show in March, such as crystal healing, angel healers, and an organisation purporting to be a Human Rights organisation, when it is simply a front for the Church of Scientology. As Cork City Hall is a public forum, we would have thought that you have a duty to hold exhibitions that provide useful services to the public and which do not prey on human vulnerability or gullibility. Is there a quality control process in place, in terms of who is allowed to exhibit, and what is permitted to be exhibited? If a group or organisation is advocating therapies or services that conflict with the best available evidence, is this of concern to you? If large sums of money are changing hands where the promised benefits are either totally unproven or proven not to work, is this something that you might wish to explore further? People, of course, have a right to spend their money as they see fit. Our query is whether a public forum, such as the City Hall, is an appropriate venue for services that have highly dubious social value. Magician James Randi spectacularly debunks faith healer Peter Popoff’s alleged powers. What’s the Harm in believing in Psychics? Categories: Pseudoscience | Tags: Cork City Council, Cork City Hall, faith healing, mediums, psychics, Sally Morgan | Permalink. That’s an excellent letter to the Cork City Council Colm. Wonder why they haven’t replied? Maybe they’re waiting for an invitation to come and explain to us some evening at the Castle? I would be very happy to discuss this with them. I think I’ll be waiting some time, though.